Last weekend, my youngest kid turned 11. If you recall, that's the age when Harry Potter got his invitation to Hogwarts in the first book. So what better way to celebrate than a Potter-themed birthday party? Brilliant! But I can't take credit for the idea, that's was my son's. And truthfully, my wife did all the planning and most of the work. My contribution – other than, "Hey tall guy, can you hang this?" 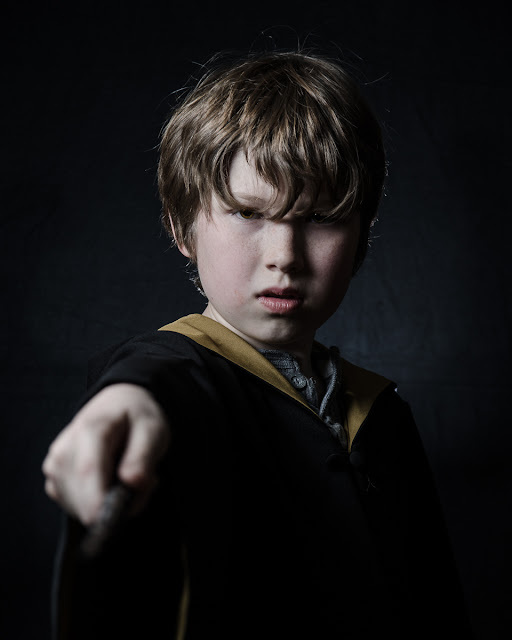 – was to create Potter-themed portraits of all the attendees. We planned two pictures each: One would a fun "Wanted" poster like the iconic one with Sirius Black. The second would be a slightly less sirius, but more serious, portrait styled after the movie posters. Unfortunately, I can't post an example of one of the Wanted posters because I somehow didn't get one with my own kids! (This would be an absolutely unforgivable offense for a hired pro, but I'll hide behind the "I'm Just a Dad With A Camera" excuse.) You'll just have to take my word for it that they came out great and look like one of the weathered, sepia toned pictures from the movies, only without the magical motion. For the movie poster portraits, we set up in our library which is the darkest room in the house. I used the black backdrop again. This time it was all artificial lighting. The key light was a 24x24 softbox in standard portrait position – camera left, angled down at the subject at about 45 degrees. I set up a rim light on a short stand behind the subject, shooting up at the back of the head. The rim light provided just a tiny bit of separation between the subject and backdrop and also spilled a little bit of light on the backdrop, which I liked. My camera settings were such that ambient light had no contribution to the overall lighting – it was all artificial. As I mentioned, the movie poster pictures required minimal adjustment in Lightroom. Basically, I tweaked the exposure a little, de-saturated the color a little, and set the white balance to be a little cold (i.e. towards the blue side). The crucial bit for this look is the de-saturation and cold white balance – that really sells it. In a couple of cases, the kids had bits of birthday cake on their mouths that I zapped with the healing brush. Ah, the life of a Dad Photographer, working with amateurs.